Diverse-City – celebrating diverse artists and work in our community. Live Magazine! is back for a third season! Live Magazine! is a multi-curated, multi-disciplinary series that takes place in our Cox & Palmer Second Space. 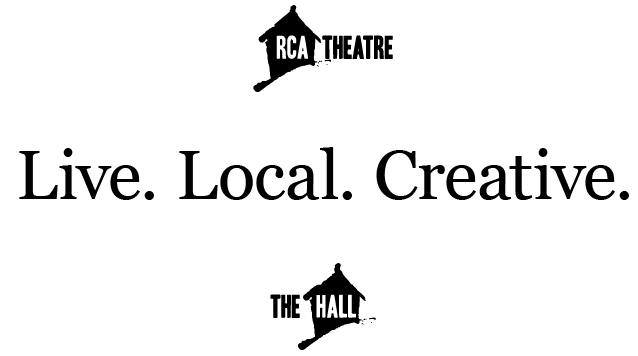 Each show features an evening of entertainment curated by a different artist in the community. As always, there will be happy hour drink prices and free snacks. This issue will be curated by Paul David Power of Power Productions. 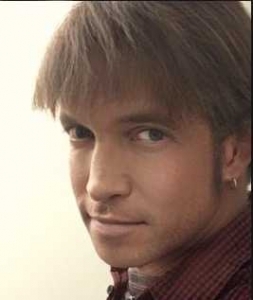 Paul David Power has spent the past 25 years working as a writer, actor, director and communications professional in various mediums including dramatic script for the stage. His most recent project “Crippled” made its professional debut at the LSPU Hall this past February. Paul has worked with many national arts organizations including the Canada Council for the Arts and the National Arts Centre to examine and further the disability, Deaf and MAD arts sector. 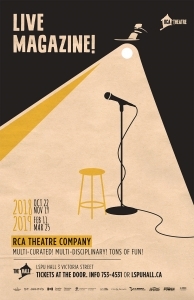 His company, Power Productions, is committed to creating supporting diverse and accessible theatre projects, with a focus on the disability, Deaf and MAD arts sector. 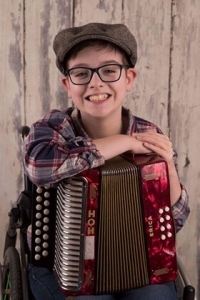 While most teenagers are into the Top 100 hits, 13 year old Brandon Bowen from Conception Bay South loves to jam out the traditional tunes on his accordion. Brandon has Cerebral Palsy but he doesn’t let his disability get in his way when it comes to his musical talent. Brandon has been playing his accordion for 4 years, he played in many festivals such as NL Folk Festival, Eastport Accordion Festival, George Street Festival, Music and Friends Festival in Bell Island, Janeway Telethon, O’Reilly’s Pub and he even had the opportunity to play with some popular NL bands such as Shanneyganock, Rum Ragged and Masterless Men. Brandon has his own band – The Brandon Bowen Band with his good buddies Russell Molloy and Dave Spurvey. They are always helping out with volunteering to play at events and going to senior homes. Brandon has also branched off into the acting industry. Brandon has played in the role of Connor in the new CBC Show called Little Dog – Season 1 (2018) and new Season starting in 2019. Brandon will also be in the upcoming NAPE commercial in November month. Diana is a multi-instrumentalist, performer, storyteller and songwriter. Originally from St.John’s, Newfoundland she has spent the last ten years living and working in BC, Montreal and Nunavik. 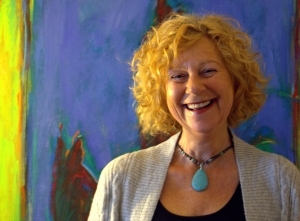 She is the administrator for DanceNL and the Festival Coordinator for St.John’s International CircusFest. 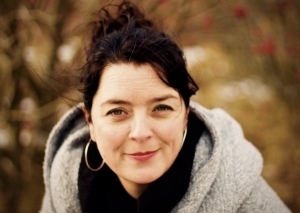 A lover of story through song, image, dance and spectacle, Diana has a keen interest in printmaking and Ethnomusicology. Favourite projects that she has created include: The Fogo Island Song Share, the Lhasa de Sela Youth Stage (now in its 7th year!!) for the Montreal Folk Festival, her EP “When Women Kill” (www.ladydaly.com), being the “Femme d’Orchestre” for the puppet show “Kate Crackerberry” and all of the musical experiences with her students in Puvirnituq and Kangirsuk. Diana is deeply grateful to have the privilege to be part of the Daly Family Collective where she gets to tell stories about her extraordinary family with her dear friends, Louise Moyes and Anne Troake in the stage show “If A Place Could Be Made”. Anne Malone is a Guide dog wrangler, bias-defiant writer, speaker, and creator who envisions and advocates freedom from disability for people who are blind or visually impaired. Malone’s writing plumbs the depths of history, the classical arts, and popular culture to reveal the origins of deeply buried cultural beliefs about the abilities and characteristics of people who are blind, and the catastrophic consequences these misbeliefs have on blind/VI people around the world. In partnership with her guide dog Cheryl, Anne opens the eyes of the sighted to the complexities of living with blindness in a visual world. 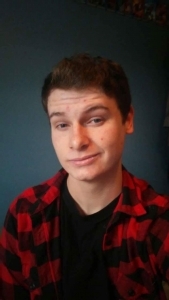 Kyle Saunders is a stand up comedian, improvisor and actor attending Memorial for Psychology. He has been volunteering and advocating for mental health since his diagnoses with bi-polar at the age of 14. It has been a wild hilarious ride of manic mental mischief. That makes for an interesting life which wouldn’t be possible without the incredible support and patience of family and friends throughout the years. Kyle also keeps himself healthy with basketball, lifting weights, soccer, and attempting to not eat so much junk food. Which has an amazing affect on keeping him sane-ish.